No single riders in the last loaded seat was a requirement when I worked at the park in the mid-'90's and it went away some time in the late-'90's or early '00's. It was explained to us an insurance requirement that allowed for the possibility of 2 people to see all of the loaded seats on a train in the event of an accident. The had a similar requirement for at least 2 riders on every flat ride. The rule came back after the NTAG accident. Great report of SFOT! I really need to make this park a priority next year. It's only about 7 hours away, and as many times as I've been to Dallas, I still haven't been to the park yet. bigboy wrote: No single riders in the last loaded seat was a requirement when I worked at the park in the mid-'90's and it went away some time in the late-'90's or early '00's. It was explained to us an insurance requirement that allowed for the possibility of 2 people to see all of the loaded seats on a train in the event of an accident. The had a similar requirement for at least 2 riders on every flat ride. The rule came back after the NTAG accident. Thanks for explaining. Still a weird policy. I'm just glad the other Texas parks don't have it. ytterbiumanalyst wrote: Great report of SFOT! I really need to make this park a priority next year. It's only about 7 hours away, and as many times as I've been to Dallas, I still haven't been to the park yet. It was torture when I was sent to Dallas for work last year since it was a beautiful 70 degree day yet the park was closed. Definitely glad to get to visit this time. Man oh man I really need to get to Texas. Awesome update! Thanks! Yeah I highly recommend it. If I had more time I would have loved to hit Schlitterbahn or the parks near Houston, so that just means I'll make a return trip someday. 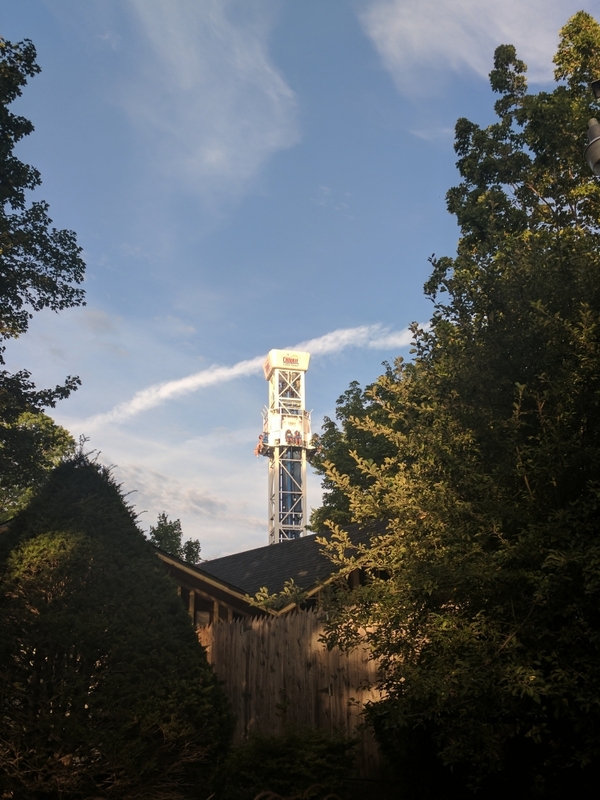 As for superman tower of power, It used to have a lot more power to the launch, A former mechanic at the park "retired" and good personal freind told me after I asked him the year it changed "2012 - 2013 i think" why it had lost its pop that they were no longer running the full allotment of air compressors to operate the ride to save on energy costs and dropped the operating PSI to match the reduced generating capacity. As for the Texas giant the no single rider in the back policy was instated after the indecent in which a woman fell from the ride. Yosemite Sam on the other hand has that policy to dissuade goofy teens from exiting the boats and vandalizing up the animations. Thanks that explains a lot about the variability between S&S towers. I had a hunch that incident was the reasoning behind the back row policy but I can't see how that practically would do anything. I had plans fall through on a Friday afternoon. 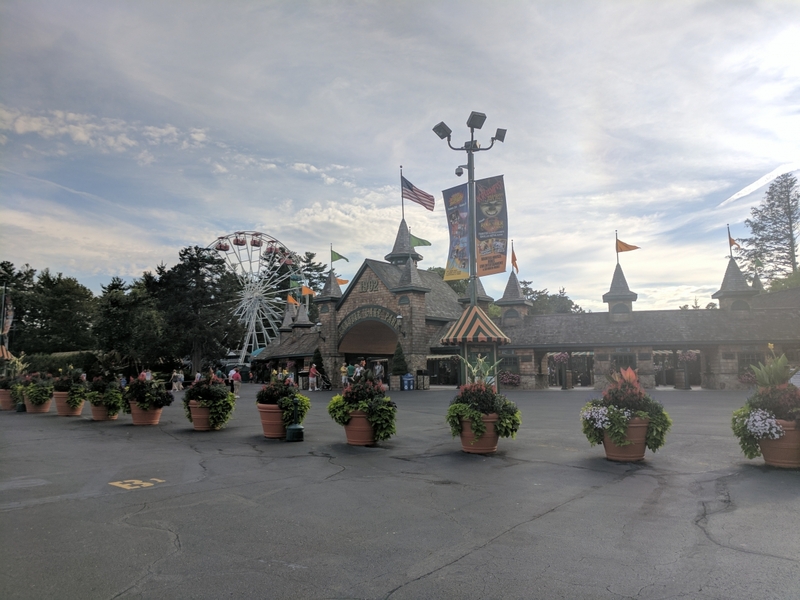 Since it was a gorgeous 80 degree day, I decided to go 5 miles north on the highway to Canobie for my second visit of the year. I fully expected the park to be more crowded than my first visit this year on a dreary day, and I was right about that, but that only resulted in a max wait of 30 minutes for the Yankee Cannonball. Canobie, the happiest place in New Hampshire. This visit would also let me test out my new phone's camera. This is something that has been a year in the making. Last year, Storm Chaser annihilated my phone case. In the time I had my phone out of the case, my frame bent so I knew I'd have to replace it someday. My phone lasted a year, but it was dealt a near fatal blow by another RMC down in Texas. My phone was still functional, but the frame bend became more pronounced and it started to overheat pretty quickly. 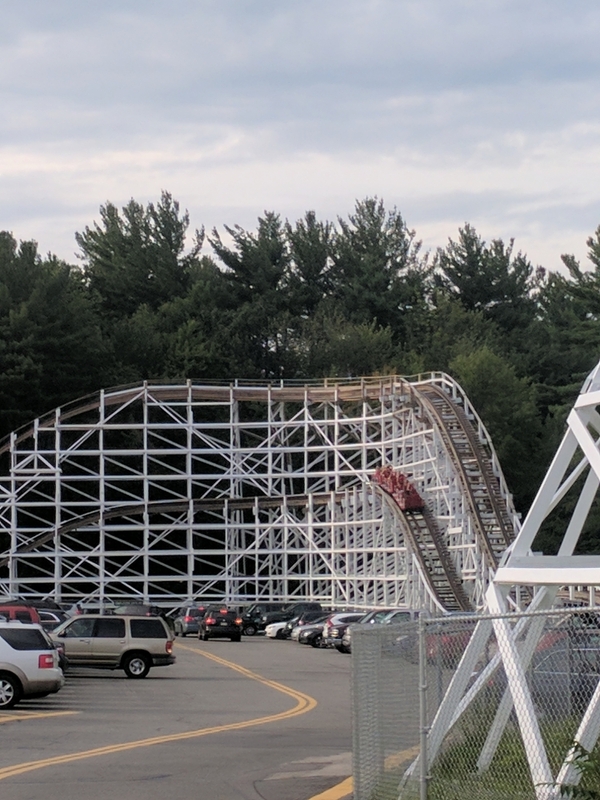 The employee parking lot runs next to the Yankee Cannonball, so I began my visit standing at the edge of this parking lot testing out my phone's camera. I had an employee watching me confused as I did it, but he didn't say anything since I stayed in the public lot. I guess if you spend 40 hours working at the park, the Yankee Cannonball doesn't look quite as fun. Overall I think the camera did pretty well. The max zoom wasn't as good as my digital camera, but it's at least passable and the standard photos may be better. For a camera phone, the zoom is pretty good. This camera will do nicely. This hill probably has the best air on the ride. GCI ruined the air off this turn, but the ride is still glass smooth at least. Since it was a relatively warm day, I decided to start off with the Boston Tea Party. 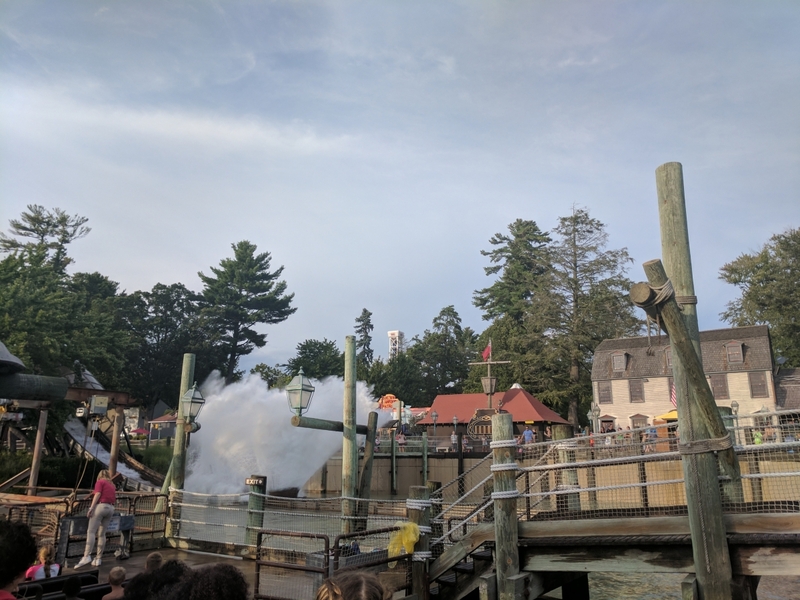 I hadn't ridden this in years since a majority of my visits have been in the evening, but I was in the mood to get soaked from head to toe on this day. It's still one of the best themed shoot the chute rides out there. 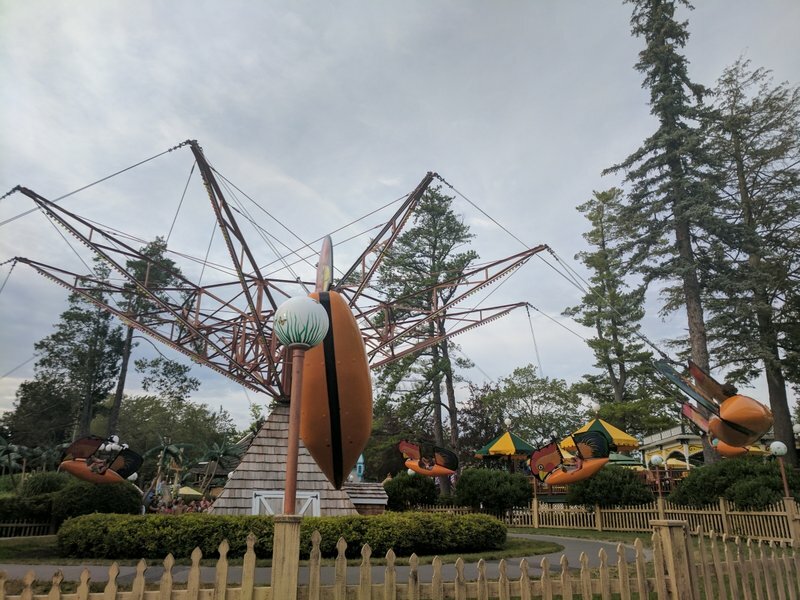 While it seems a lot of parks are removing their versions, I see Canobie keeping this one around for a very long time. It's still one of the park's marquee rides and has an entire area themed to it. 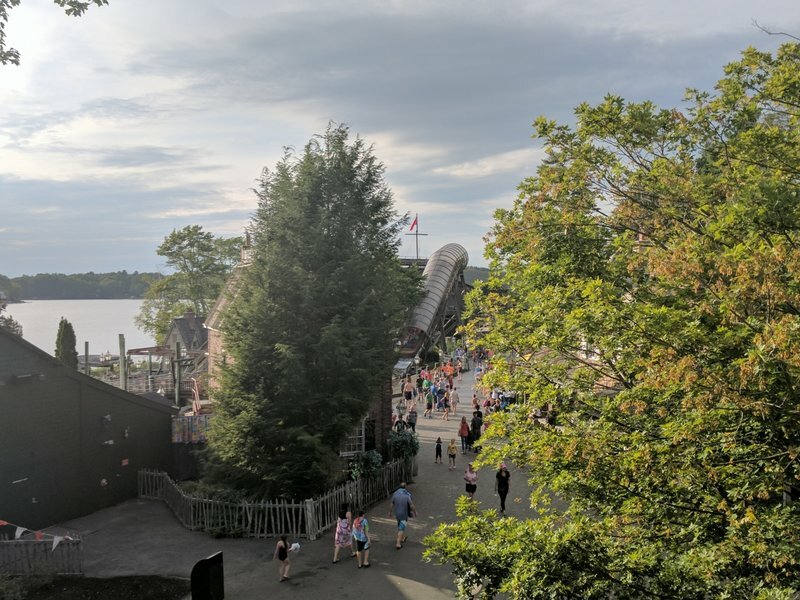 The ride itself gives a great view of Canobie Lake (the lake, not the park) and I definitely prefer the Hopkins versions over the Intamin ones. The Hopkins ones have better drops and far larger splashes. If I'm going on a shoot the chutes ride, I am expecting to get soaked so the massive wave is part of the experience. 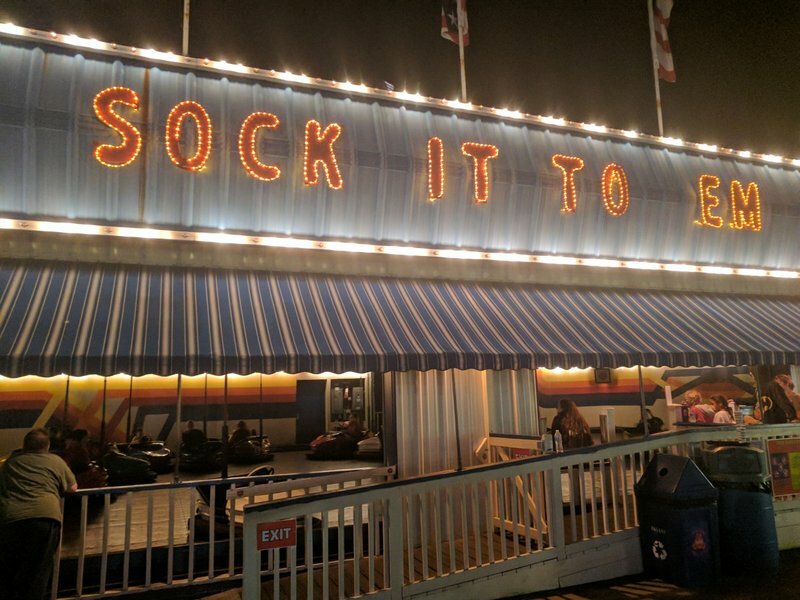 I rode it twice since it was a walk-on. How many parks theme an entire area for a shoot the chutes ride? I spent the first 2 hours riding a lot of flats. 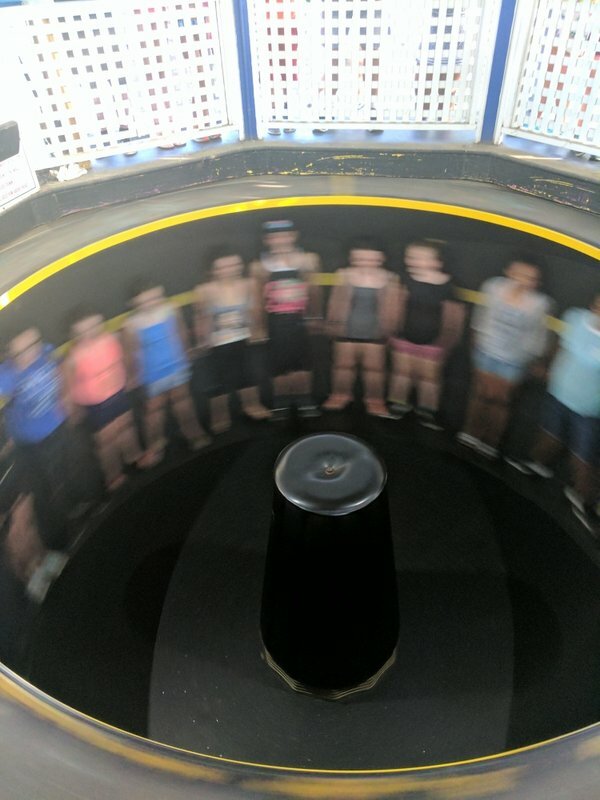 I rode the Turkish Twist twice. After the first run, I was still damp from the Boston Tea Party so I needed to go back in the dryer. I also rode Star Blaster and the queue moved much more slowly than I anticipated due to only one worker checking the restraints (usually they have 2). 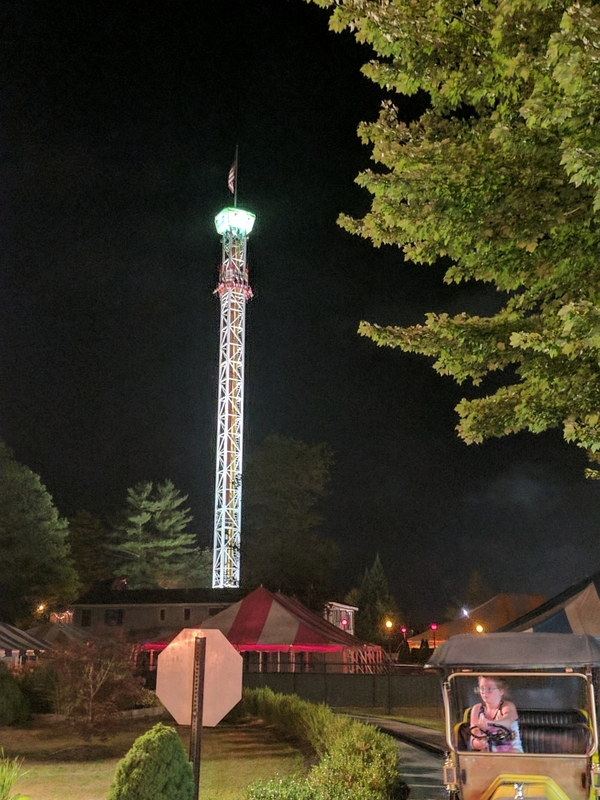 I ended up waiting a half hour, which is double what I usually wait, but the airtime at the top of the tower made up for it. After the Boston Tea Party, I felt like a piece of wet laundry. Blasting towards the stars (and not the eclipse). Two flats I did not get on were the Matterhorn and Xtreme Frisbee. The former has been gone for over 10 years at this point. 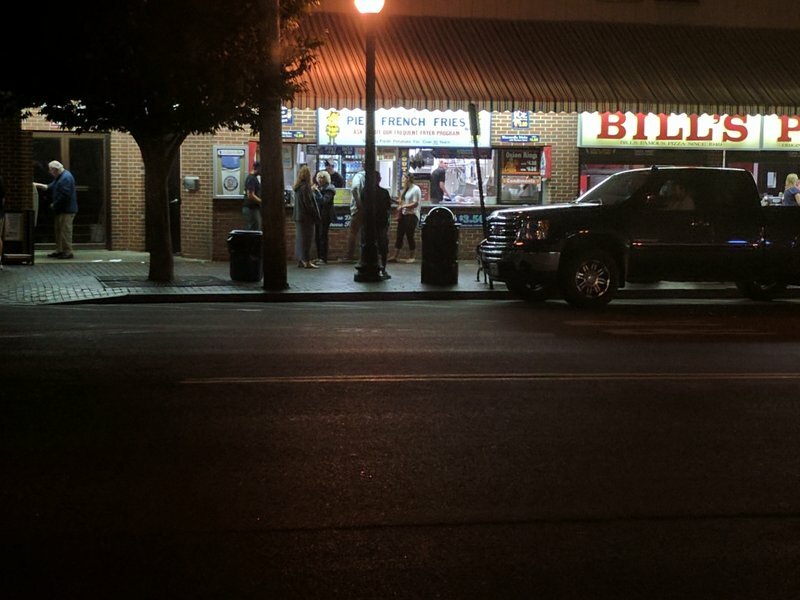 In that time it has been replaced with a hot dog stand, the amazing Equinox, and then the hot dog stand again. That pad really needs a ride there and there may be movement on that front. I made sure to take a peek during the day after not seeing much at night in my last visit. 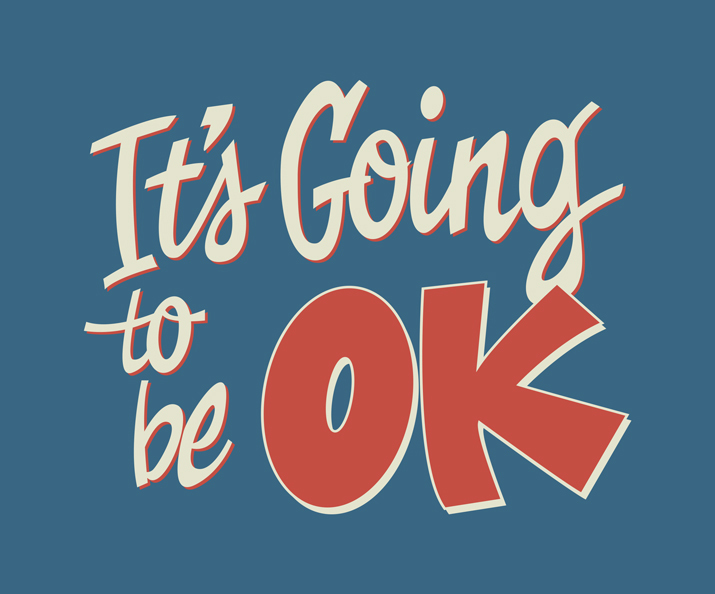 It's hard to say what's coming, but I'm optimistic after years of not receiving a new ride. Then the Xtreme Frisbee has been down for a year at this point and it's not even on the park's website anymore. Please be for a new ride. I'm sick of that hot dog stand being here. I am seriously wondering if the Frisbee will ever run again at this point. I had planned to ride the Corkscrew once. As I walked up, I saw a group of people waiting behind the railroad tracks. I didn't see a train coming so I was wondering why the land of jaywalking had a group of people sitting there like a herd of sheep. Much to my amazement, the line extended beyond the tracks. I had never seen the queue that long before so Corkscrew was dropped from my plans. The kiddie coaster didn't have a wait on the way by, but I decided to move onto bigger and better things. When the kiddie coaster is pulling a line, you know it's a busier day at the park. And the better things were the park's two major coasters, Untamed and Yankee Cannonball. I started with Untamed since I wanted to save the latter for night. Untamed appeared to have a 15-20 minute wait, but I was able to skip that using the ride's somewhat hidden single rider line. I got two rides in a 10 minute stretch. I really wish this thing had lap bars like Hydrus, but it's still a very enjoyable coaster as long as you brace yourself for the changes of direction. I don't know what area looks better, Boston or Big Bear Plaza. It was about 8:30 so I decided to head over to the Yankee Cannonball. It had a full queue, which equates to just over a half hour wait. I knew I'd be able to get at least 2 rides in, but I was hoping to get 3. 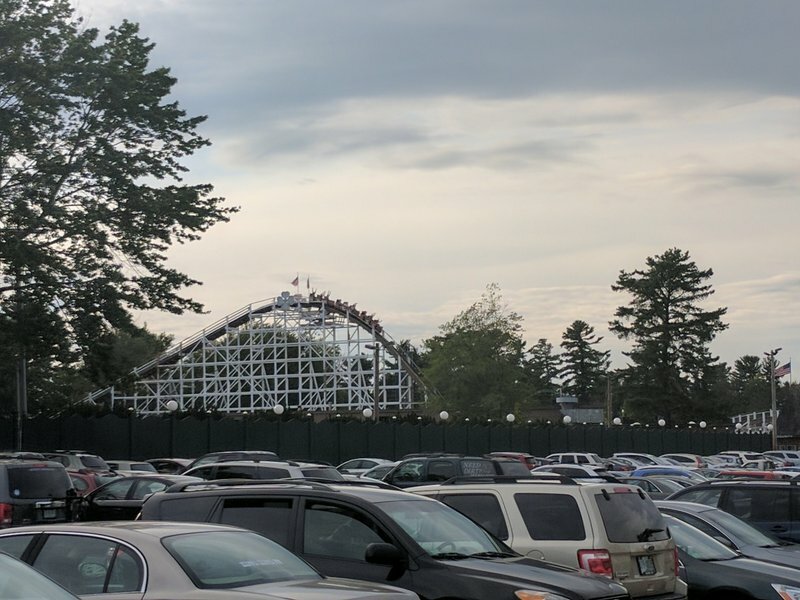 The park routinely closes the Yankee Cannonball's line down around 9:30 (something that has burned me many times in the past), so I was hoping I'd get off my second ride before the cutoff. I only got two rides as the wait was closer to 35 minutes that 30 minutes (in this case, every minute counted), but on the bright side I got the very back for my last ride. As I said in my last Canobie report, the back is by far the best seat on the Yankee Cannonball. There's a major difference between that seat and even the second to back. My last ride in the darkness was fantastic. Plenty of great air on the larger drops and even some surprise pops on the return leg which is usually air free. 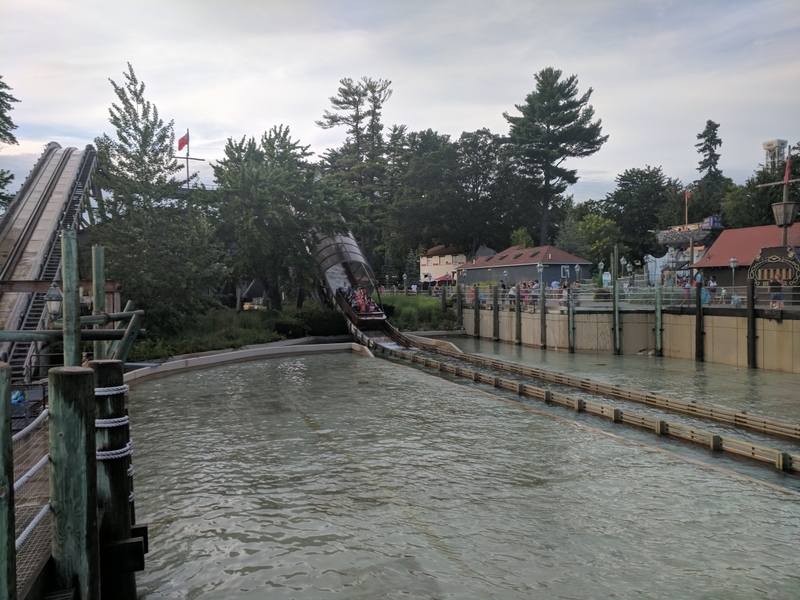 With the queue line for the Yankee Cannonball closed, I decided to finish up with the Log Flume. I was able to get 3 rides in. After the Yankee Cannonball, this is definitely my favorite ride in the park. 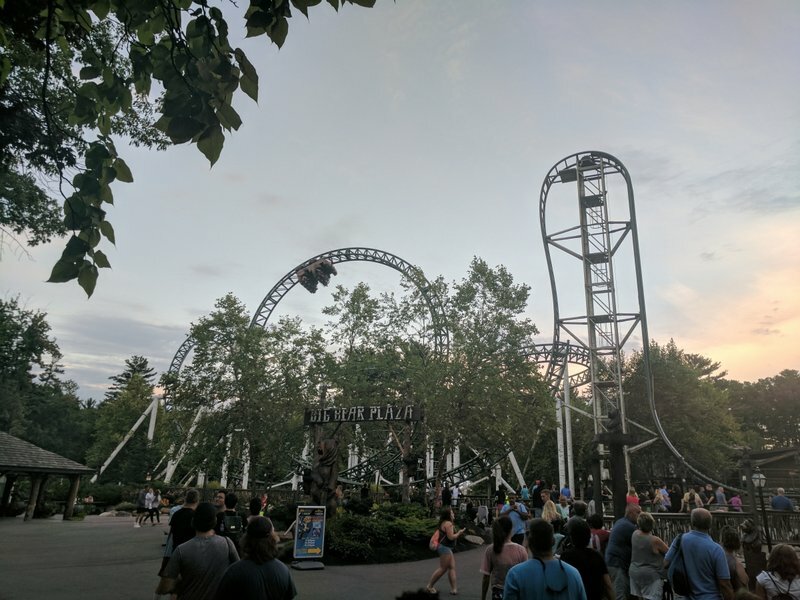 I rarely ever ride this during the daytime since I know I can get on with no line at the end of the day and there's something peaceful riding through the woods in the evening. When the Yankee Cannonball's queue line closes, this is the best backup plan. 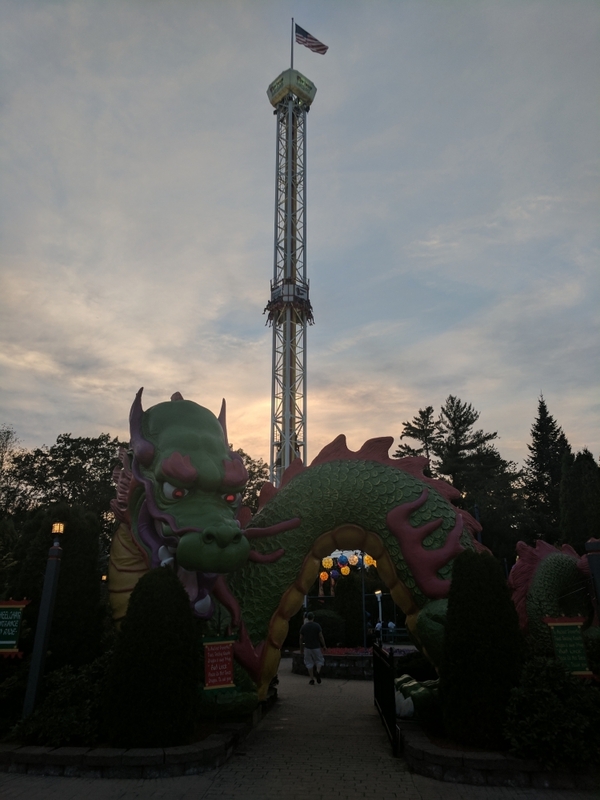 Overall it was a quick impromptu visit, but I had a great day as usual at Canobie. It was the perfect excuse to test out my new phone's camera and ride a few of my favorites at the park. I really do hope they have a new ride coming next year since it has been several years, but regardless I will definitely be sneaking up there at least once or twice after a day of work. 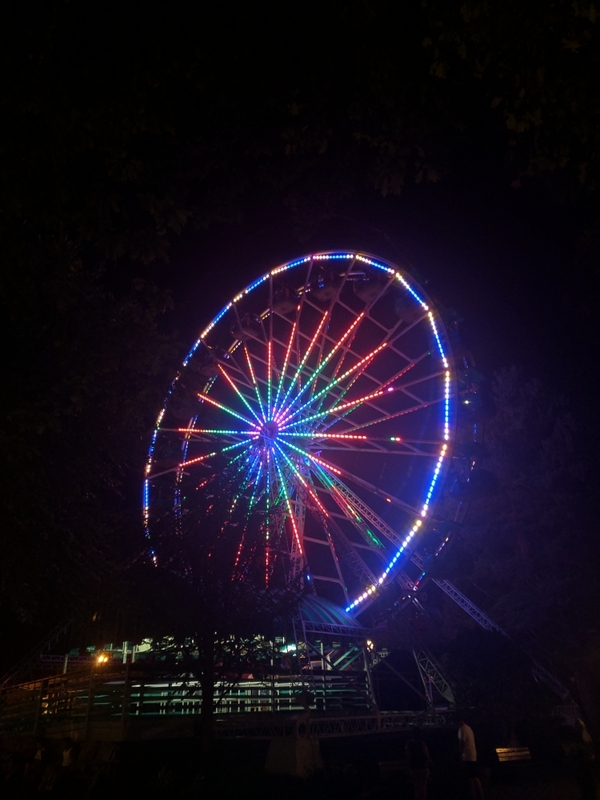 My phone handled the light package of the Ferris Wheel pretty well outside of the double effect. On a beautiful Saturday afternoon, we decided to make a quick trip up to Funtown to take advantage of their crazy cheap twilight ticket where you can get in for $13. I'd pay that alone for a few rides on Excalibur let alone the other rides in the park. We had a few hours to kill before that deal kicked in. Traffic on I-95 burned one of those tickets thanks to all the Massachusetts idiots going to Hampton Beach (there are seriously much nicer beaches in Mass- Nantasket, Cape Cod, Rockport, etc). After crawling across the Maine line, we decided to make a pit stop in York. For most people, that's to visit the big lighthouse and the beach. 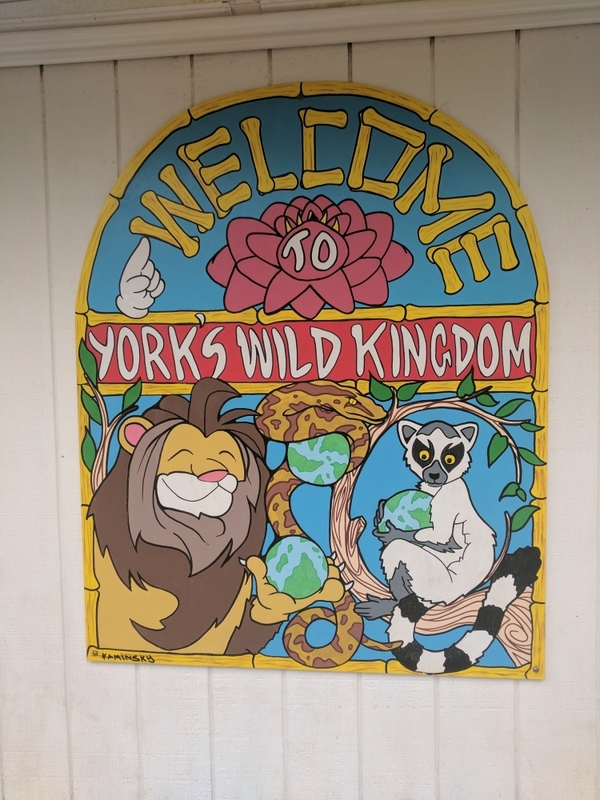 Privy enthusiasts know that there's a little zoo with an even smaller credit known as York's Wild Kingdom. You'd think it was only a zoo based on this sign. But not based off of this entrance. The Ferris Wheel is run very fast and gives some great views of York. 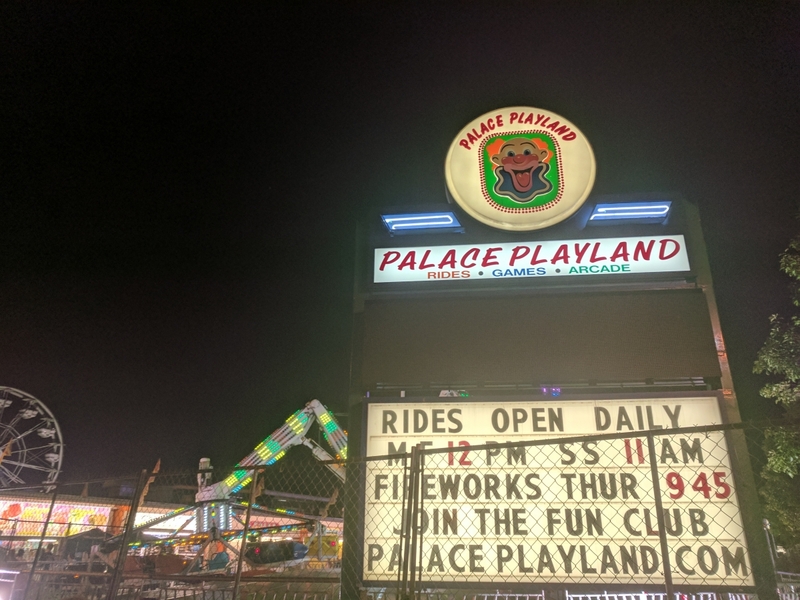 They used to have a respectable credit with a Flitzer until the late 1990s, but they decided to remove it for batting cages the same year that Funtown opened Excalibur. A few years back they re-entered into the coaster scene with the Wacky Mouse. You may think this would be a wild mouse style coaster, but instead it's an ever popular wacky worm. I didn't ride it. Not because I'm above credit whoring, but because I already had the credit from my trip last year. The park's main draw is the zoo. I probably haven't been to the zoo side in 10 years at this point, but remember it being solid. 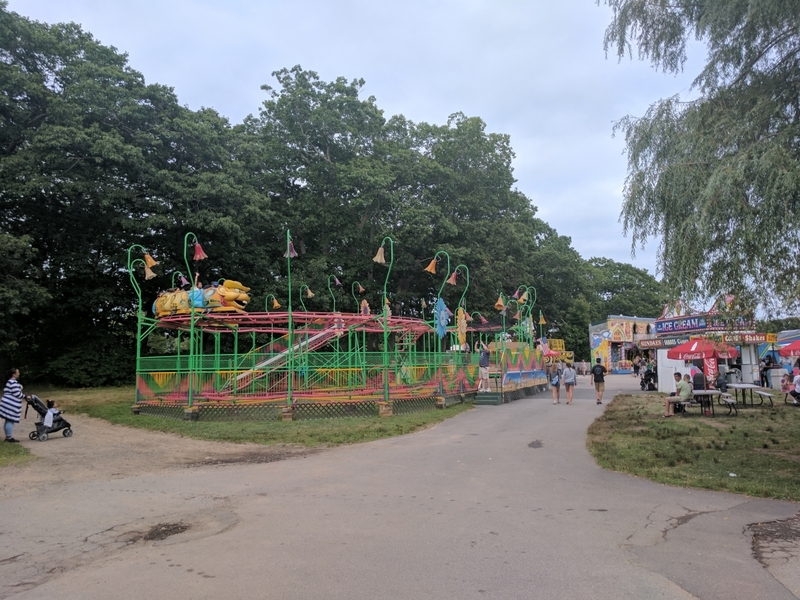 The ride side has 2 good fun houses, a scrambler, a round-up, go karts, and kiddie rides. They used to have a great set of bumper cars, but the old pavilion was torn down and they got a set of modern cars that move so painstakingly slow that it's simply not a fun ride. The park also has a great Ferris Wheel that is run much faster than most parks. We actually passed right through the park (that says a lot about the park) to tour downtown York. The water was frigid so we didn't really go on the beach, but we walked through downtown York for a bit passing the homemade candy shop and eventually popping in the old arcade, Fun-o-Rama. 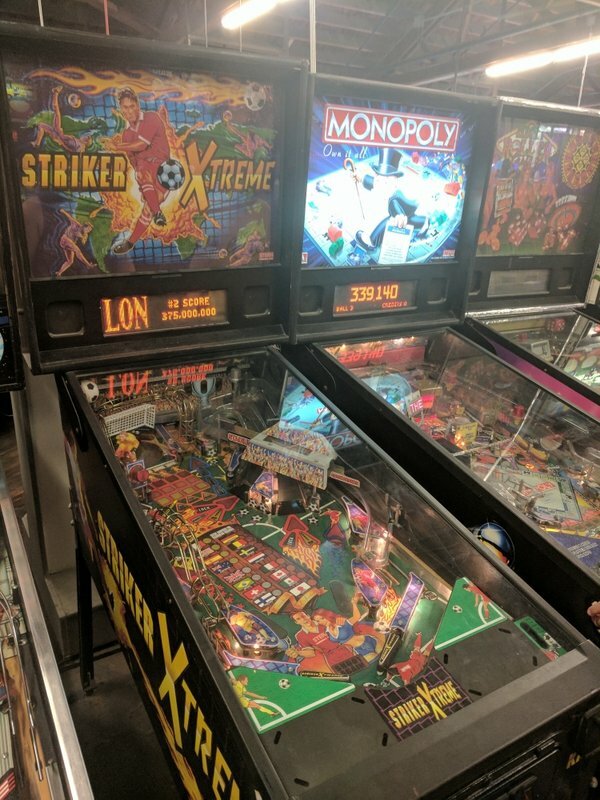 They had an excellent section of older games, highlighted by 2 rows of pinball machines. Pinball is still the best arcade game. Like most New England beaches, the water was frigid. 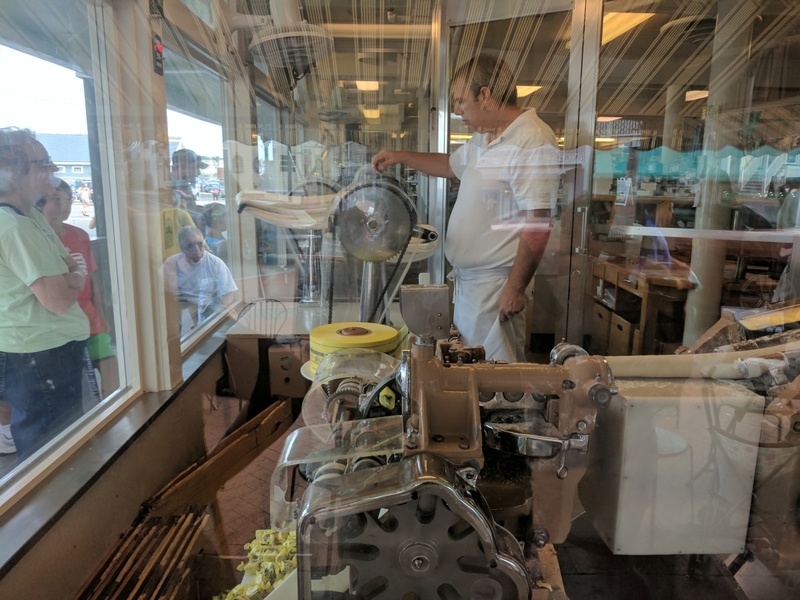 I could watch this machine all day. It's refreshing seeing an arcade without the initials D&B. Fun o Rama had a great selection of pinball machines. They got more money from me than York's Wild Kingdom. 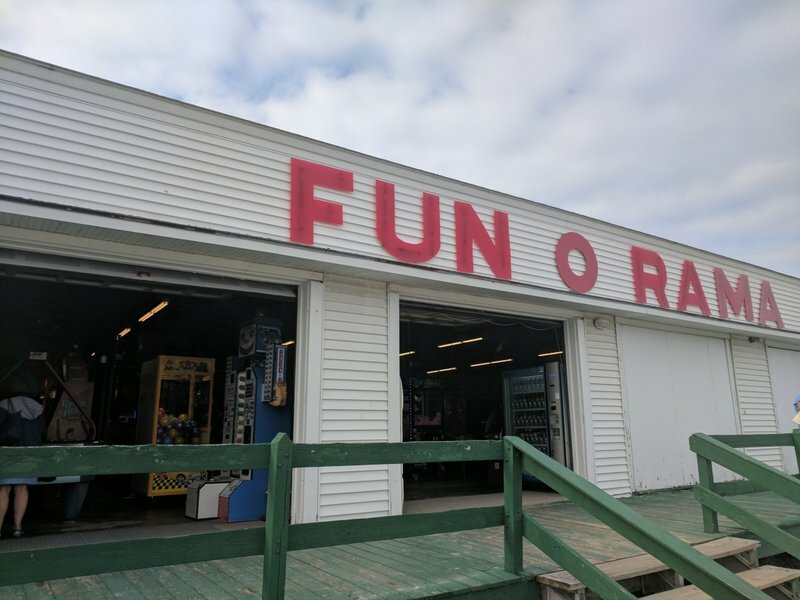 Funtown is a park that I almost bought a season pass for the past two years. They have a good wooden roller coaster, some nice flats, a fun log flume, and a great water park. They are also only an 1-1.5 hours from me. So what's stopping me? The value. 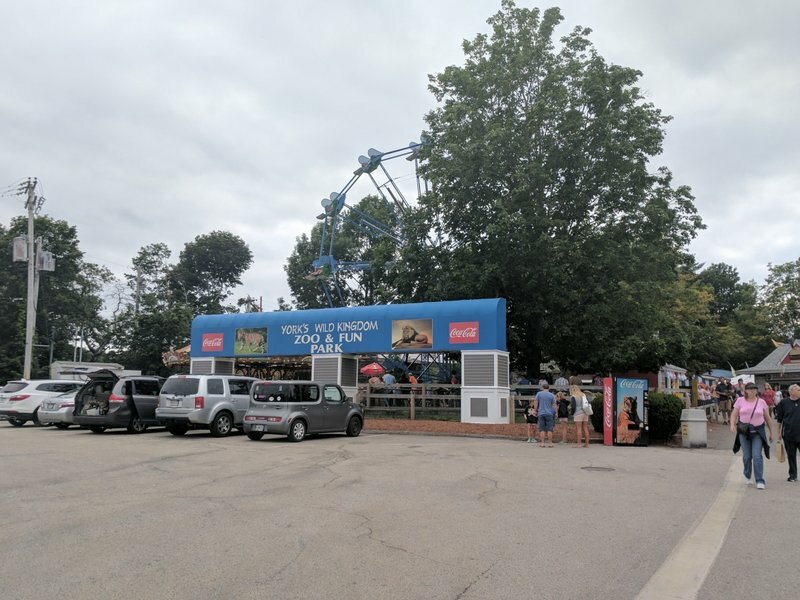 While a season pass costs over $100, Funtown offers one of the best deals on twilight tickets in the industry at $10-$13. That's an amazing deal! Since I definitely wouldn't make it to the park over 10 times per year, the twilight ticket is the way to go. For a 10 pm closing, the super discounted twilight ticket begins at 6 pm. 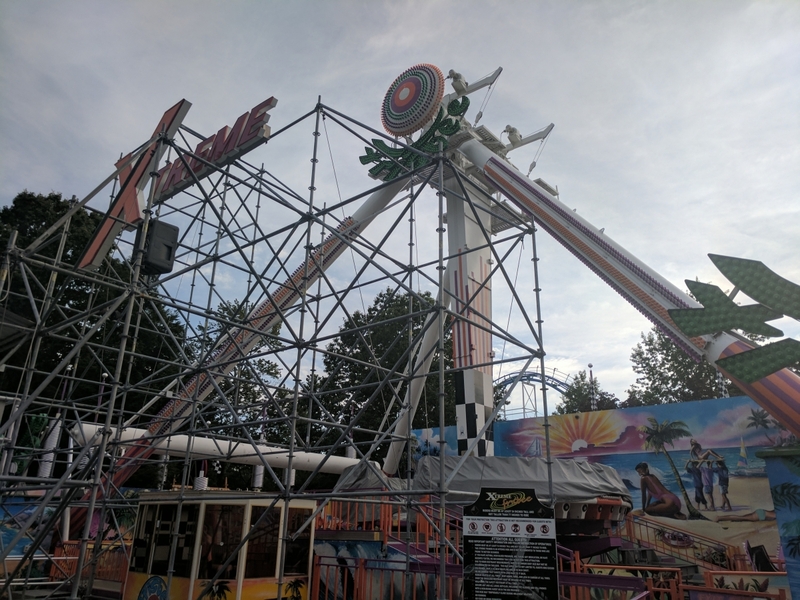 With the low crowds Funtown gets, 4 hours is more than enough to hit the major attractions and get several rerides on Excalibur. They also have another twilight ticket starting at 3 pm that's $20. For that reason, I don't feel the need to get there at opening and pay almost $40. I made sure to visit on a Saturday when the park was open until 10 to get some night rides on Excalibur. I'll pay $13 for four hours at an amusement park any day of the week. Dragon's Descent rides as well as it looks. If I'm at Funtown USA, why is one of the park's largest areas themed to China? It really towers over everything else in the park. It was at this point I had a realization about the park's "theme". 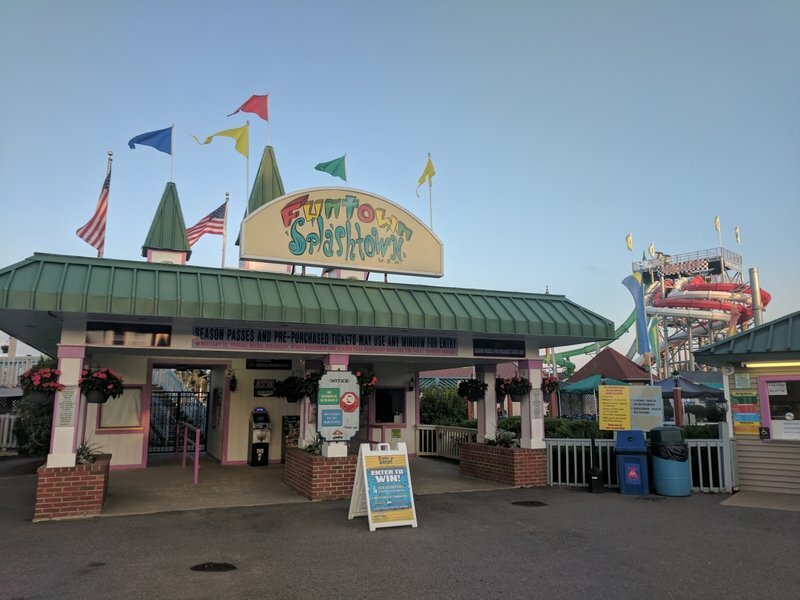 Why does a park called Funtown U.S.A. have sections themed to China (Dragon's Descent), Europe (Excalibur's area), and Mexico (the big restaurant across from the Antique Cars) yet nothing themed to the US? The park looks great, but it was just a weird observation I made during my most recent visit. I guess the park wanted to represent the diversity of the US with the theme? It looks dry now, but it's anything but that when you give a New Englander a quarter. Enough foreplay, it was time for Excalibur. This CCI creation is the coaster that really put Funtown on the map. At one point, Excalibur was my favorite coaster. The ride hasn't gotten any worse, I have just been on over 400 other coasters since I first rode Excalibur. It's still a good coaster and in the top third of the woodies I've been on since the park has maintained it well. Like Dragon's Descent, the park did a great job theming Excalibur. The Camelot theming is a very nice touch, but the best part about Excalibur is its setting. 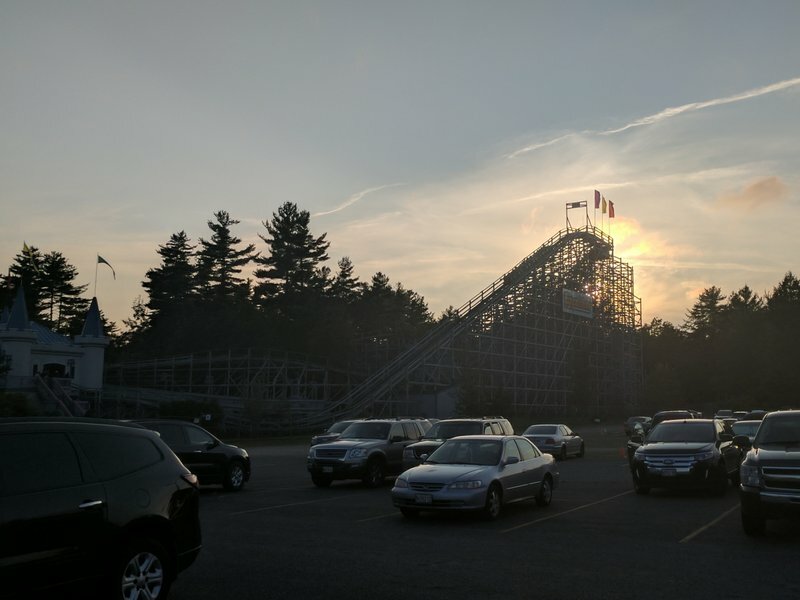 It is located entirely in the woods, which conceals the layout for first time riders and creates one heck of a memorable night ride when the sun sets. 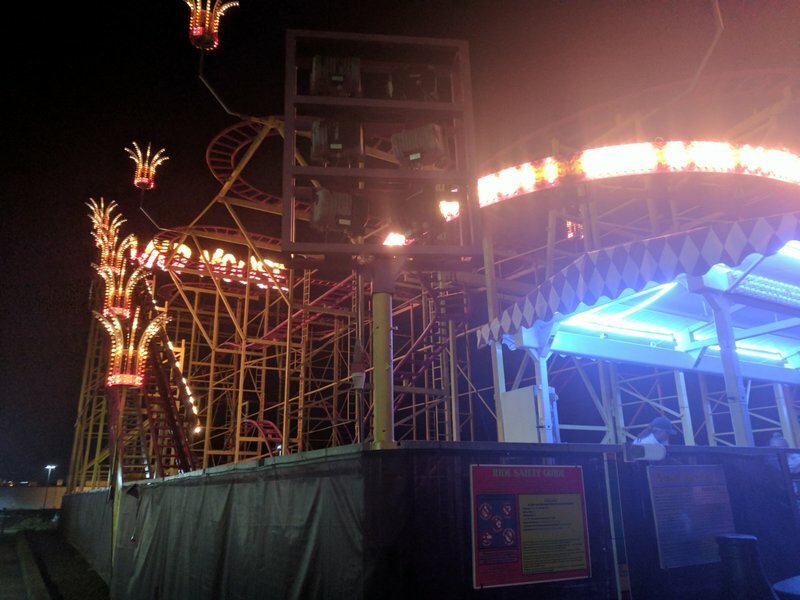 For that reason, I strongly recommend visiting Funtown on a day when it is open until 10 so you can maximize night rides on Excalibur. Despite only running one train, crowds weren't an issue as it was only a 2-3 train wait for the front or back seats. It's a toss up which seat I prefer, so I distributed my rides equally. 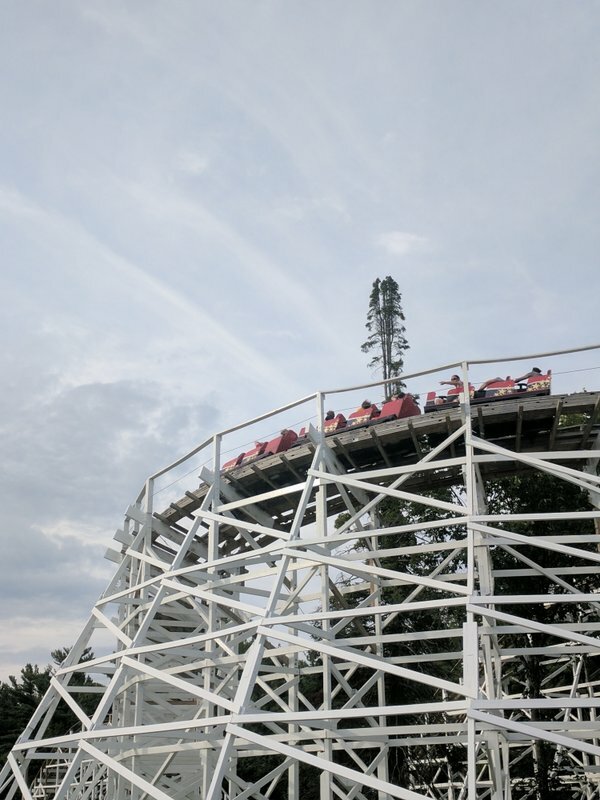 RMC and Intamin have since surpassed Excalibur in this area, but at one point Excalibur had one of the steepest drops on any wooden coaster. The first drop still packs a mighty punch in the back seat. The first half of the ride has some amazing speed and air. The first turnaround gives a major pop of ejector air combined with some laterals. The next turn is probably the roughest point on the ride, but it's still completely tolerable. It's a lightly banked turn with some great laterals. The next bunny hill is puny which gives airtime that is anything but puny. The subsequent turnaround is much like the first one with some fantastic air and laterals. 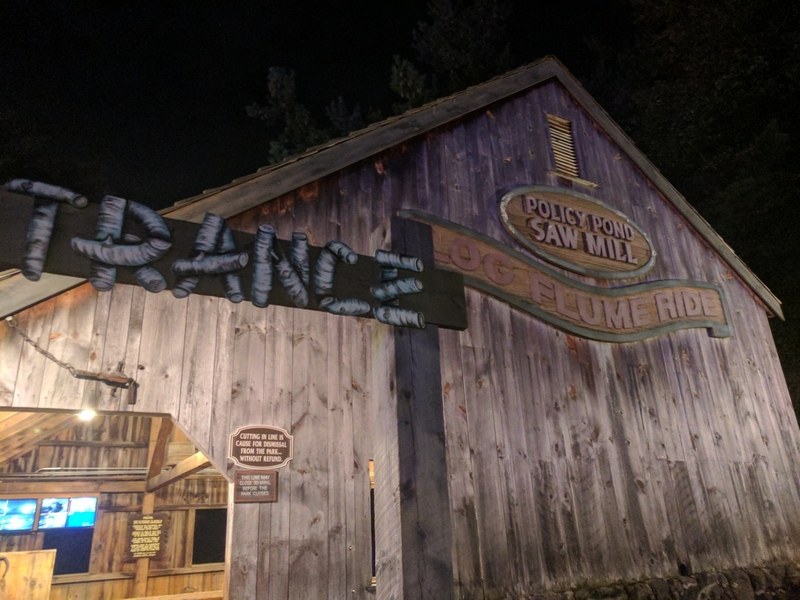 Still one of my favorite coasters to ride at night. The setting in the woods is perfect. Definitely one of the wilder wild mice. No divider and a blind eye to head on collisions, yes please. With a half hour left, we returned back to Excalibur to finish the night. We got a ride in the back and it was even better at night. The entire layout was pitch black outside of the lift hill and the ride felt so much faster. Since it was a complete walk-on at this point, the park was more than willing to save you a trip down the long exit ramp. They had you exit the train and herded everyone just beyond the exit gate. After they opened and closed the air gates, it was the running of the bulls for any open seat. Since we didn't want to elbow anyone for the best seats, we instead chose to walk around to get one last ride in the front row. We re-entered the queue around 9:55 and were next in line for the front. Two 20-something year olds entered the queue line behind us. The ride ops came over and said the next ride would be the last of the night. Sweet! We got in line just in time. The ops asked the two behind us to switch to another row. 95 times out of 100, people may be disappointed but they will move. These two dug their feet in the sand. "We had our hearts set on the front seat. We didn't drive 50 minutes to be denied the front. This will run our whole visit." Eventually the employee said they could run another train. On one hand, that was great since we would get one extra ride on Excalibur (albeit probably in the middle with the stampede for the seats). On the other hand, I wish the employees hadn't caved into them. As we boarded our train, we heard the two behind us saying, "Those people [us] look like they have their hearts set on the front seat too. If they weren't selfish and moved back a row, the employees could have made this the last train of the night." I had to try so hard not to make a scene, but I'm sorry that we're being selfish for not giving up our spot in line for two people who didn't want to wait an extra 5-10 minutes earlier in the day to ride in the front row. We got back and those two sat down in the front row. We let the masses choose their seats and then ended up in the 3rd to back, which was a great choice all things considered. It was another great ride. As we returned to the station, the two in front started a "One more time" chant. Again, we were being the selfish ones. 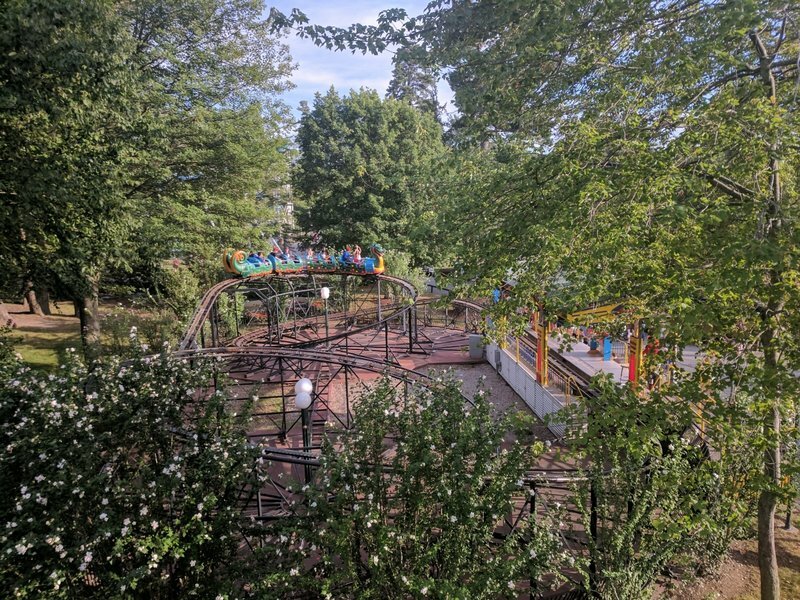 Funtown may not be as good as Canobie or Lake Compounce, but it's another smaller park that serves as an alternate to Six Flags New England. I can safely say that I'll be making at least 1-2 visits up to the park per year for the foreseeable future as long as they keep that great twilight ticket going. Afterwards, we stopped at Old Orchard Beach to get some greasy goodness at Pier French Fries. 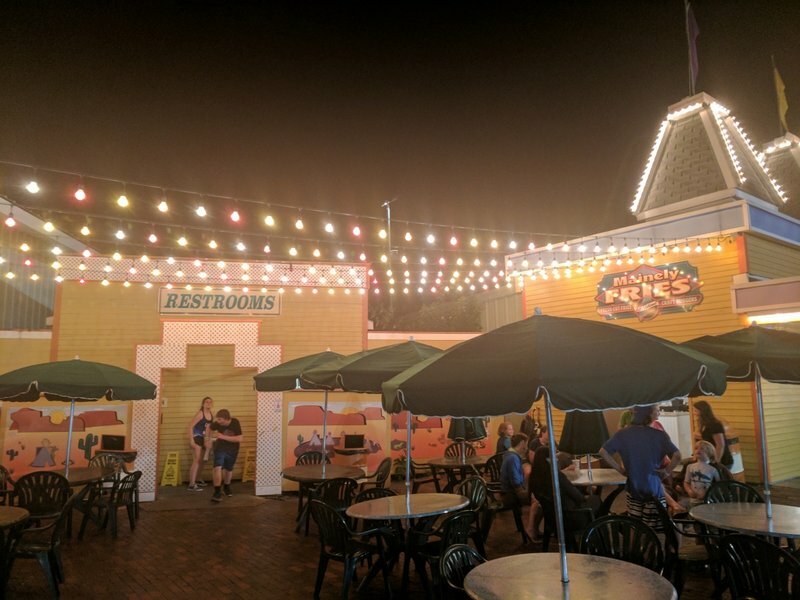 A staple of OOB, the pier fries are crispy crinkle fries that will certainly clog your arteries. But they are so good we quite frankly don't care. 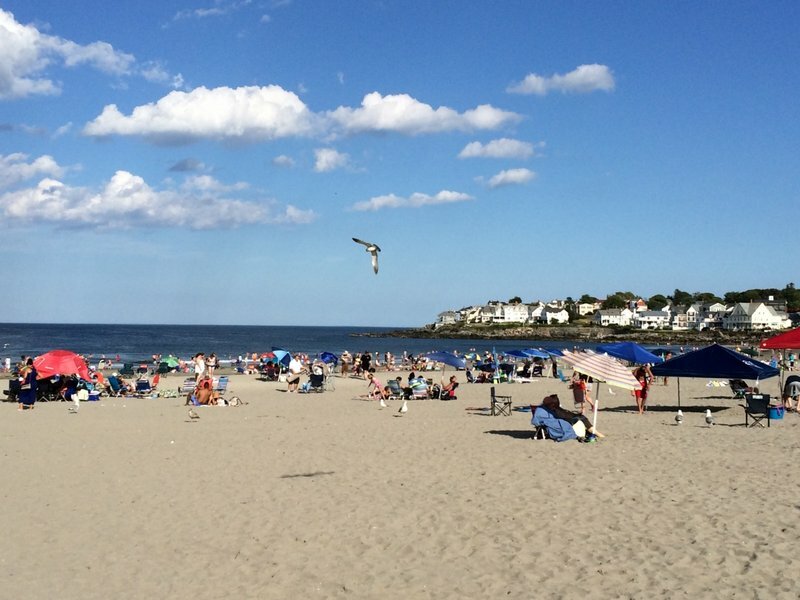 The place is directly across from Palace Playland, OOB's beachfront amusement park. Think of Nathan's fries. Except imagine them good. That's Pier French Fries. It really has the feel of a permanent carnival rather than a theme park so we didn't stop in, especially since it has been quite some time since they added anything new. 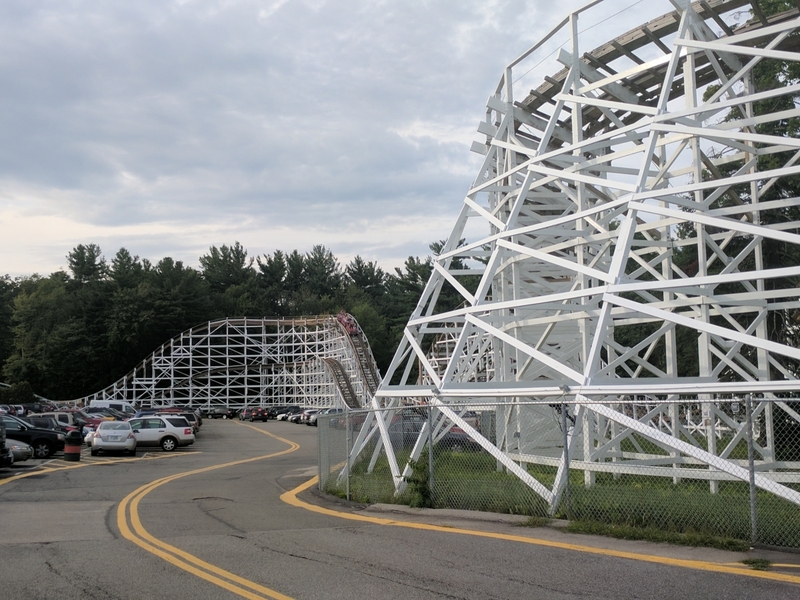 I'm hoping they replace the Galaxi with a new coaster in the near future, but honestly I wonder if the park will be sticking around after so many other New England beach parks closed. I mean this is the one that lasted? 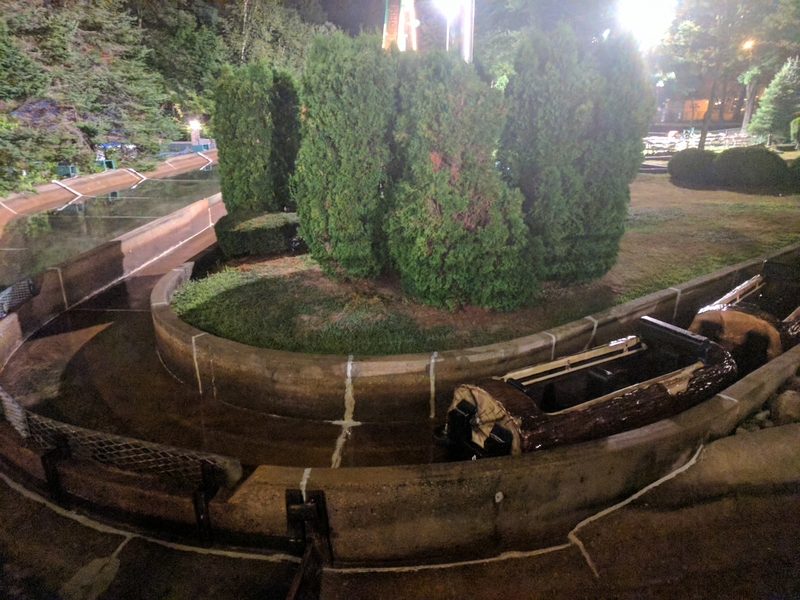 The weird thing I observed about the park's closing is that it occurred in phases. 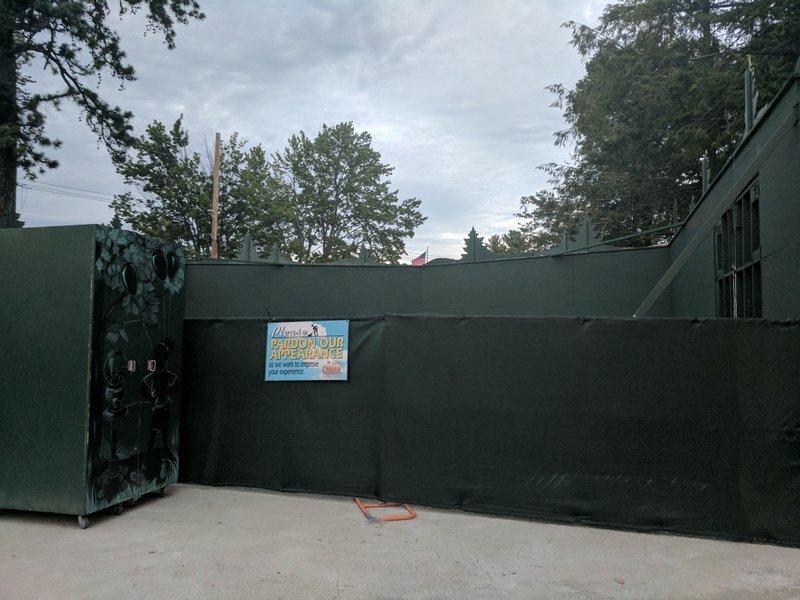 The back half of the park closed at 11. The front left closed at 11:15. And the final quadrant closed close to midnight. 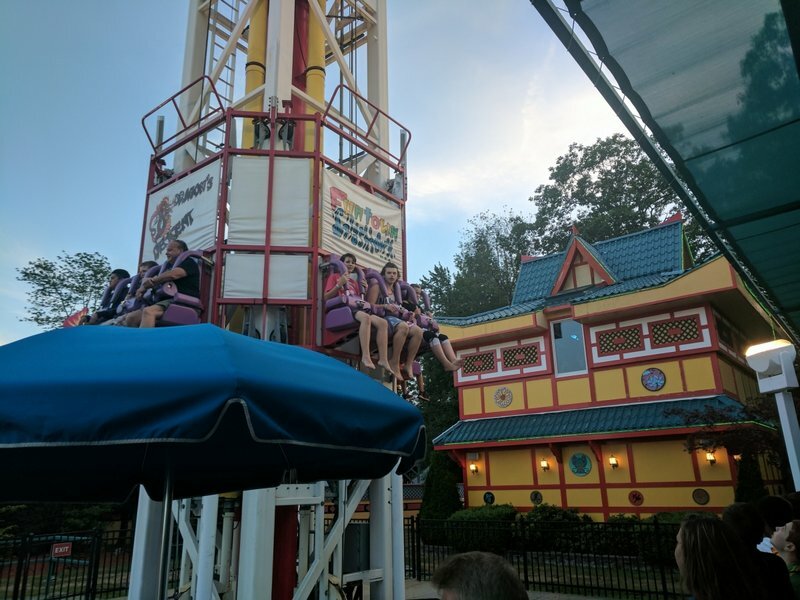 It was pretty weird seeing them keep a Yo-Yo, 40 ft tall drop tower, and Troika open over everything else, but they still had riders so I don't blame them. That clown is pretty creepy.